Early in 1801, a group of Alfriston 'dissenters' who used to meet in a house in North Street, were inspired by an itinerant preacher to build themselves a proper church. Money, time and labour were all freely provided and the project was completed in time to open for worship as the Independent Church of Christ on 2nd August 1801. During the early years, there was a famous incident when a dispute over the minister led to him being forcibly ejected from the pulpit. One of the perpetrators was Stanton Collins, the leader of the old Alfriston smugglers. In 1906, the congregation became part of the Congregational Church. Then in 1972 entered into a union with the Presbyterian Church to form the present United Reformed Church. There have been various additions to the building over the years, including the gallery supported by pillars which were formerly ships masts. Close to the church is the Memorial Hall, which was purchased as a memorial to men lost during the 1914-18 war and before that date it was called the Gun Room due to its original function as a storage place for a huge gun during the Napoleonic Wars. 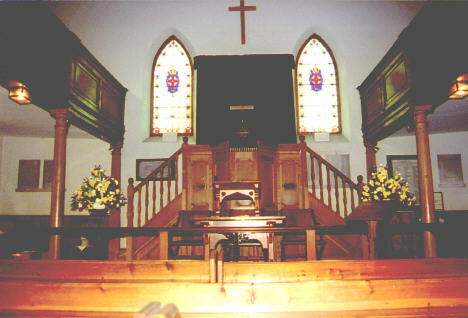 The hall is now used for meetings and for our combined Sunday School. Galleries exist around three sides of the church. The church is quite often locked. Sunday Services are held at 11.00am and the church is open to visitors daily from 9.00am to 5.00pm or dusk.